The symptoms of asthma range from very mild to life-threatening based on the individual. While some people experience symptoms only at certain points or have infrequent attacks, others may deal with asthmatic symptoms 24 hours a day. If you are struggling with this medical condition, then we invite you to have a look at the list of asthma clinical trials currently enrolling participants. Exercise: If you have asthma, then strenuous exercise could lead to an attack. These asthma attacks tend to be worse when the air is dry and cold. Occupational Hazards: If you work in an environment that exposes you to a lot of airborne irritants, this can be very risky. Various irritants that could be encountered at the workplace include dust, chemical fumes, and gases. Allergies: If you are allergic to pollen, dust, or pet dander, these things can easily induce an asthma attack. Talk To Your Doctor If…. 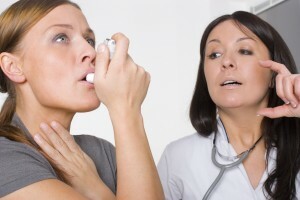 If you think that you may have asthma, then you should schedule an appointment with your doctor. A cough or frequent wheezing that has persisted for a few days could be an indication of asthma. Additionally, you do not want to wait too long as immediate treatment can help prevent any permanent damage that could occur. For those who have already been diagnosed with asthma, they will need to work with their doctor in order to better manage their condition. The proper long-term control of your asthma symptoms will allow you to live a healthier and more fulfilling life on a daily basis. Not to mention, the long-term control of your condition could help to prevent a life-threatening asthma attack.